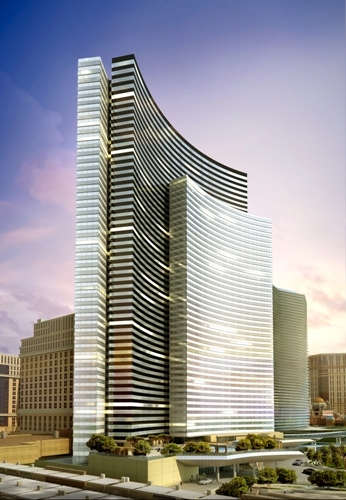 As I continue to write about the High Rise Condo market in Las Vegas, VDARA condo/hotel in City Center is my next post. I’m enjoying providing this information to clients interested in owning a piece of Las Vegas. If you haven’t heard about City Center, take a look at my CITY CENTER POST. It’s a quick way to get caught up with the huge MGM MIRAGE project in the center of the Strip in Las Vegas. These Condos are fully furnished turn key hotel residences with all the amenities you would find in a high end hotel on the strip. When you have the MGM MIRAGE developing a project, you know that customer service is of the highest quality. There are many types of floor plans available from Studios, one and two bedrooms. Penthouse units are available also in studios, single story one and two bedrooms, and two story one and two bedrooms. All residences are equipped with energy efficient appliances, front load stackable name brand washer and dryer. The style is modern with gorgeous dark woods, huge windows, and a flat panel television.